Webinar Video : SD RevRec is Dead. Now What? Join Us to Find Out. With the deadline for implementing ASC 606 and IFRS 15 now behind us for most public companies, a lot of CFOs and accounting staff have breathed a sigh of relief. However, for those companies running SAP ECC who chose the short-cut of using SD RevRec, there are still some big challenges ahead. Even some choices that seem safe in the short run can turn out to be dead ends. Now, as companies that took the SD RevRec "short-cut" look ahead to the future of SAP with S/4 HANA, they are discovering that SD RevRec will no longer be supported. Oops, dead end! 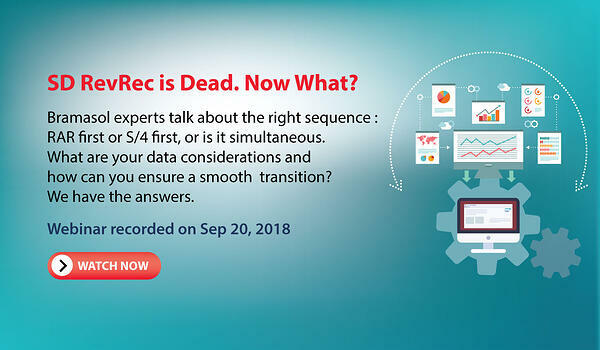 If you’re facing this specific challenge of how to get from SD RevRec in ECC to RAR supported in S/4 HANA, you should watch Bramasol’s recorded webinar. Titled “SD RevRec is Dead. What Now?” this webinar will provide a roadmap for moving from your soon-to-be-gone SD RevRec implementation to a more sustainable Revenue Accounting and Reporting (RAR) solution that is integrated with S/4 HANA. Listen as our RevRec Center of Excellence experts talk about the right sequence – RAR first or S/4 first, or is it simultaneous. What are my data considerations and how can I ensure a smooth transition? Click below to watch recorded webinar on Sep 20,2018.